We are delighted that you are considering baptism, whether it is for yourself or your child. Baptism is a rite of initiation into Christian discipleship and a means of grace. We perform baptisms for people of all ages. We are committed to providing a place of welcome and hospitality in which those coming forward for baptism, together with parents, godparents, and sponsors, can explore and grow in the Christian faith and remain faithful to their baptismal promises. If you have further questions after reading this, please contact the Church Office at 505-662-5107. Parent(s)/Adults are first encouraged to come along to the worship at Trinity on the Hill to ensure that they are comfortable with the type of worship and happy to make Trinity on the Hill their spiritual home. 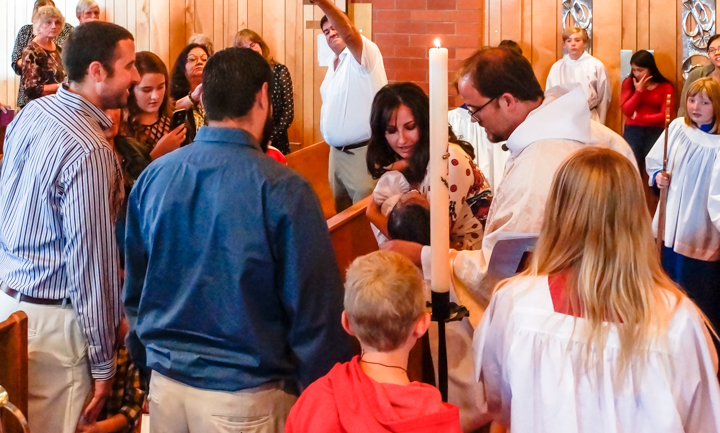 We prefer that individuals seeking baptism or the parents of a child to be baptized are involved in our parish for a period of at least three months. When you are sure this is the church for you, you should speak to the Rector and meet to complete a baptism application form. We encourage parents and, when possible, godparents to come to the 10:30am service on Sundays. These services will help to give you a basic grasp of the life and worship of the Christian community and enable you to feel part of this worshiping community. Are there any special requirements to be baptized in the Church? There are certain requirements that must be met, but these shouldn’t be an obstacle to baptism. Parent(s)/Adults must be involved in the parish for a period of three months prior to a baptism. Where parents are bringing a child to baptism, at least one parent must be baptized. If one parent or both are not baptized, they may like to consider baptism for themselves. What does it cost to have a baptism? There is no baptism fee, but you may like to consider a donation towards the support of the life and ministry of the church. Do I have to go through any special teaching? In baptism, God pours out grace upon those who come to be baptized. To prepare you for this special moment there will be mandatory baptismal preparation classes. There will also be an explanation of the order of service and the Christian significance of the rituals. We will explore the commitments and confession of faith that will be made by parents, godparents/sponsors and the church congregation so that it will be familiar to on the day of the baptism. Godparents/sponsors are invited and encouraged to come to the teaching but we recognize that it may not always be possible for godparents to attend. The Easter Vigil (the Saturday night before Easter Sunday), the Day of Pentecost, All Saints’ Day or the Sunday after All Saints’ Day, on the Feast of the Baptism of our Lord (the First Sunday after the Epiphany), or when a bishop is present. Do I have to be a regular church-goer to get my child baptized? Trinity on the Hill recognizes that many people who want a baptism for their child may not be regular church-goers. Since the service of baptism requires promises on the part of the parent(s) and godparents to bring their child up as a worshiping member of the Church and to instruct their child in the Christian faith, it is strongly encouraged that the family will join in the worshiping life of the Church prior to and following the baptism. What are godparents and sponsors? The role of the godparent or sponsor is to pray for their godchild or the person they are sponsoring for baptism and to help them find their place in the Church. It is a requirement that godparents/sponsors are baptized. The Church is aware that there are many adults who were not baptized as children. Often, adults in this situation feel like they have missed their chance for baptism. Trinity on the Hill would like to reassure you that it is more and more commonplace to baptize adults and these are joyful and wonderful occasions. Baptismal preparation for adults is tailored to meet the needs of the individual. Can I be baptized by Immersion? Yes, if you would like to be! Many people prefer to be baptized at the font inside the church where water is poured upon them. It is becoming more common for adults to choose to be baptized by full immersion. Trinity on the Hill is happy to offer baptism at the font or by full immersion according to a person’s preference.